The Abundant Life Garden Project is sponsored by Episcopal Relief and Development has six updated modules plus prayers and things to do at home. Water of Baptism, Water For Life: An Activity Book by Anne E. Kitch offers ways to connect the waters of baptisms with how we can conserve water and care for the earth. Godly Play: The stories of Creation, Ruth, Noah’s and the Ark, and the Parable of the Sower, plus other lend themselves to great conversations with children. 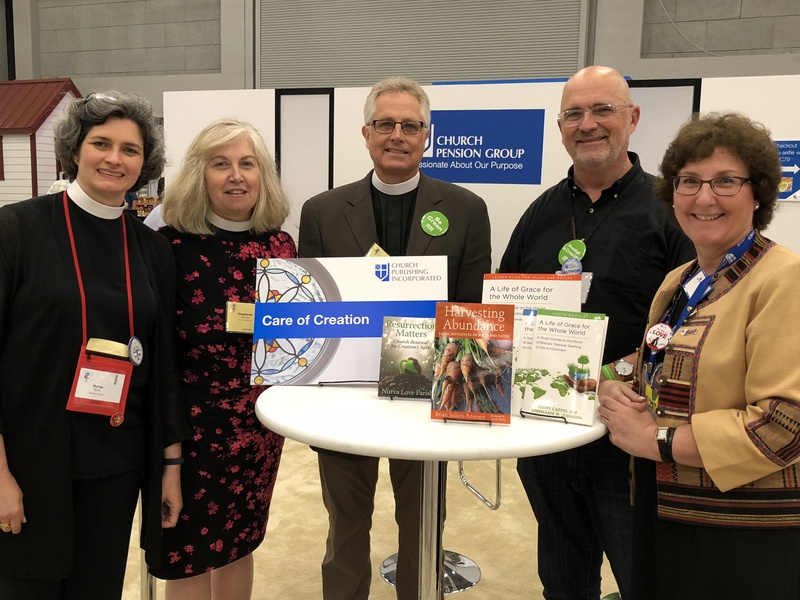 A Life of Grace for the Whole World by Stephanie Johnson (who was one of the speakers at #GC79’s Care of Creation TEConversations) and Jerry Cappel offers a Leader Guide and Youth book that encourages active engagement through the viewing of videos, use of technology, and a range of activities. Exploratory questions for the facilitator allow for open-ended conversation and discussion of current events around environment and faith. Connecting the five-week session is the creation of a Tree of Life, which is added to during every session. And the Adult book uses Bible study, discussion questions, reflections on sections of the Book of Common Prayer, and other activities to encourage active learning. Each week participants are asked to reflect, in different ways, on their faith communities and their own spiritual journey and how they can find a more meaningful connection with God’s active work among all creation. Church, Creation, and the Common Good: Guidance in an Age of Climate Crisis by Ragan and Emily Sutterfield offers a hopeful answer to the challenges facing us with global warming. Through scripture, tradition, and Christian practice, it guides church communities into deeper understanding of their role as the Church in the world and how they might be communities for the common good in this time. This curricular resource is sure to foster rich conversations and provide a path toward love of all creation and our particular places as we face the climate crisis together. To Serve and Guard the Earth by Beth Bojarski is a downloadable curriculum for high school groups and adults (6 sessions) that connects the growing Christian environmental concern with the theology of creation in Genesis. It not only provides the participants with a greater understanding of the scriptural accounts of creation and the environmental problems facing us today, but also encourages the participants to make practical applications to change their everyday lives and enhance important environmental values. Hospitable Planet: Faith, Action, and Climate Change by Stephen A. Jurovics seeks to fill the gap in religious and secular texts by providing both a compelling biblical case for action on climate change and by identifying substantive measures to mitigate climate change and how to achieve their implementation. The book describes quite clearly what actions to undertake, how to accomplish them, and why this course of action can attain its objectives. Questions at the end of each chapter make it a great book for adult study. Harvesting Abundance: Local Initiatives of Food and Faith by Brian Sellers-Petersen tells the tale of 25 faith communities in story and image. An inspiration for others to develop such projects, food and faith can go hand-in-hand as we get our hands dirty while learning more about what Genesis 2 describes as God “planted” a garden. Gardening can be seen on the rooftop of a church in the city, beehives in the midst of a seminary, or a local community garden alongside the church’s parking lot. Discover where this movement is alive and growing, and find ideas for starting your own “food and faith” initiative in your own backyard, roof, or front porch. Resurrection Matters: Church Renewal for Creation’s Sake by Nurya Love Parish is a fruitful study and action guide for any church institution that owns property and in which groups gather together to grow as disciples of Jesus Christ. It helps groups connect their faith and the assets that they steward for God’s mission, recognizing these assets as gifts for ministry with their wider community. It encourages theological reflection and practical action for renewal for the church, greater biodiversity for the planet, and relief for the poor. Faith and Nature: The Divine Adventure of Life on Earth by Phyllis Strupp is an eight-session, downloadable, intergenerational, faith-formation resource focused on appreciating and living in harmony with God’s creation. Learners will build awareness and appreciation of our spiritual connection to Creation/nature in a traditional way that prepares participants to bring hope and faithful action to today’s ecological concerns. The electronic documents includes dozens of live links to additional online resources and activities. 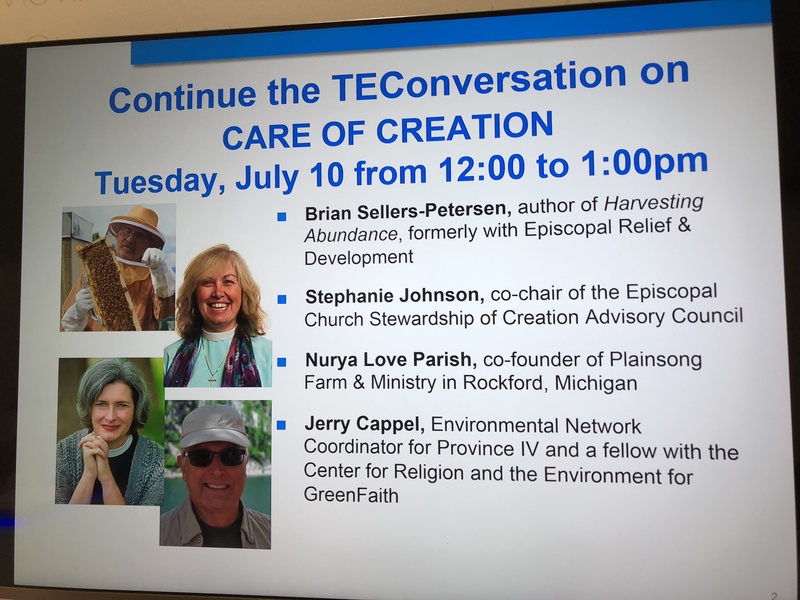 At General Convention Church Publishing offered a TEConversation with our authors about the Care of Creation.